One of the most important things you can do for your guinea pig is give him a proper place to live. While there are many different types of guinea pig cages, there are some important factors to consider when setting up your new pet's home. Giving your guinea pig a suitable cage can help him grow into a healthy, happy cavy. The most important thing you should know about guinea pig cages is that most of the ones you see in the pet store are far too small to keep a guinea pig in for an extended period. Guinea pigs need exercise, and they need to have room to explore and relax. Most pet store cages are barely big enough for a single full-grown guinea pig to turn around in, let alone share with a companion. Fortunately, you can build your own guinea pig cage cheaply and easily using a plastic sign material called coroplast and organizational cubes you can purchase at a home furnishings store. Making your own cage will allow you to design your new pet's home to your own specifications, and provide plenty of room for new friends and toys. Another reason store-bought cages can be a bad idea is that some of them have wire mesh floors. While these allow animal waste to pass through into a litter tray underneath, the harsh wire mesh can be damaging to guinea pig feet. A guinea pig can catch a toenail in the mesh and injure himself, and over time the pressure on his sensitive foot pads can lead to a painful condition called bumblefoot. No matter what type of cage you use, make sure the floor is solid to provide your guinea pig with comfortable support. While some small animals enjoy climbing on multi-level platforms in the cage, guinea pigs generally prefer flat, open spaces. Guinea pigs tend to be scared of heights, and even a gentle ramp leading up to a second level may be too frightening for a guinea pig to attempt. In addition, the ramps and ladders necessary to reach these upper levels can block running room in the main level of the cage, preventing your guinea pig from exercising freely. Choose a single-level cage with more horizontal room rather than building upwards. Once you have your cage set up, you need some sort of bedding to absorb your guinea pig's waste. There are many different types of bedding available for small animals, but you should choose one made from either recycled paper or hard wood shavings like aspen. Soft woods like pine can contain volatile oils that may make your cavy sick or cause an allergic reaction, and cedar shavings are toxic to small animals. If you are willing to spend lots of time doing laundry, you can bed your guinea pig on reusable fleece pads, but these require regular changing in order to avoid a mess. Guinea Pig Cages: The Ideal Bedding? 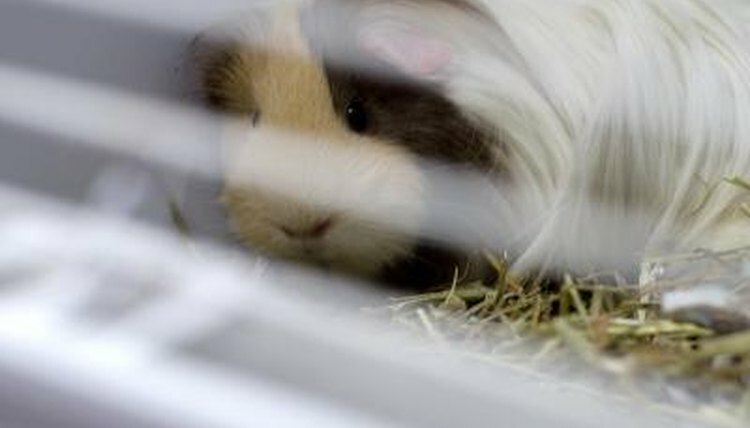 Can Fleece Bedding Make a Guinea Pig Sick?